By definition an unfinished novel shouldn’t be capable of supplying readers the satisfaction of closure, of completion. The late David Foster Wallace’s The Pale King, by this standard, is an anomaly. For starters, at 547 pages, it’s a lot of novel. Thematically, the center holds, aided by Michael Pietsch’s sensitive editing, but also because the material feels composed with a consistent core vision. As the author of the ambitious and gargantuan Infinite Jest (his career-making 1996 novel about addiction and recovery which in its own self-willed fashion refused conventional narrative closure), Wallace left behind fragments for The Pale King that are themselves large-scaled, suggesting a work that was intended to rival if not surpass the size and scope of the earlier novel. Many chapters are as fleshed-out and polished as substantive short stories or novellas. 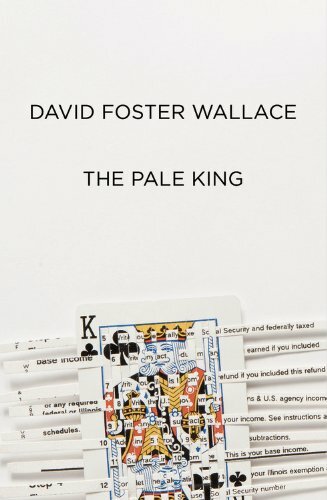 Wallace chose for The Pale King a workplace setting that in the popular imagination probably represents the sine qua non of tedium: a regional IRS office circa 1985 where workers sit at desks for hours on end processing tax returns. He imagined that the clock’s second hand possessed awareness and knew that it was a second hand and that its job was to go around and around inside a circle of numbers forever at the same slow unvarying machinelike rate, going no place it hadn’t already been a million times before, and imagining the second hand was so awful it made his breath catch in his throat and he looked quickly around to see if any of the examiners around him had heard it or were looking at him. John Berryman’s famous poem from The Dream Songs begins, “Life, friends, is boring. We must not say so.” The Pale King says so, brazenly says so, but also poignantly asks if there isn’t a means within reach of our mental apparatus (the “inner resources” that Berryman’s poetic persona claims to lack) that might transcend the void. This is ultimately a mystical pursuit, so it should come as no surprise that the novel is populated at the margins with ghosts and phantoms (a very funny chapter helpfully distinguishes between the two forms of apparition) haunting the IRS examiners’ cubicles and disturbing their monkish concentration. One accountant, when his focus is fully engaged, levitates above his desk like Teresa of Avila. Much of David Foster Wallace’s fiction takes aim at consciousness itself, particularly the mechanisms of distraction and solipsism that lead us so easily astray. The Pale King, even in its unfinished form, pursues this investigation of our inner lives further than its author has taken us before. From this measure alone the novel must necessarily be ranked among his best work. Wallace’s ability to recognize and depict both the humor and the horror in depression, anxiety, and addiction, is one of his strengths as a writer. Even before his suicide in 2008 at age forty-six, fans of his work sensed a more than casual investment on the author’s part in capturing not just the “stream” of consciousness but also its unchartered tributaries, its splintered mudflats, and its black oceanic depths. “It turns out,” runs an intriguing passage in the Notes and Asides appendix that closes out The Pale King, “that bliss—a second-by-second joy + gratitude at the gift of being alive, conscious—lies on the other side of crushing, crushing boredom.” Wallace’s compassion for the book’s troubled cast of bureaucratic misfits, drudges, and savants seems warm and real, but also fragile in its own right, helpless finally to intervene. In fact, by inserting himself, “David F. Wallace,” as one of the characters employed at the labyrinthine Peoria IRS facility, the author mind-melds with the collective unconscious of his novel. If Infinite Jest showed us the manic pitfalls of a hyper-stimulated existence for which Alcoholics Anonymous offers sanctuary, then The Pale King is a quest for quietude inscribed between the lines of the Serenity Prayer.